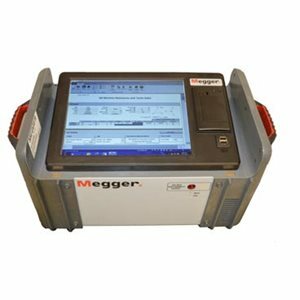 The Megger MWA300 and 330A Transformer Winding Analyzers are here to offer you a faster, more efficient testing device through combining TTR and resistance testing in a single unit. This advanced 3-phase transformer test system provides complete ratio, phase and winding resistance measurements with only one 3-phase lead-set connection. What’s more, it offers portability, a reduced set-up time and increased job safety. Once connected, the MWA300 performs DC resistance measurements on all high- and low-side windings without reconnection. It has an 8-terminal/6-winding resistance measurement capability and doesn’t need any inter-connected boxes, allowing you to test all 6 windings without having to disconnect and reconnect leads. The MWA300 series saves you even more time by using a single software platform, PowerDB, which means you only need one set-up and one easy-to-use test form. The MWA300 series can be used effectively test power transformers, distribution transformers, CTs and VTs, and motors and generators. The MWA330A comes equipped with a built-in computer that has a 305 mm (12 in) colour display and touch-screen interface. The computer is designed to control the unit and it can store up to 100, 000 data sets. Additionally this update will force the slider bars to be wide for improved touch screen usage. - Megger recommends that you return your instrument annually for calibration verification. - Any instrument returned for re-calibration will be updated with the latest firmware and software versions. - Certified Factory Calibration is valid for one year. Incorrect installation of updates or incomplete updates may cause the equipment to become unusable. If damage occurs from improper updates, the customer may be responsible for repair costs. Please download and read these instructions before performing the update below. Download this zip file and extract it to the root of an empty USB drive.